It’s the welterweight fight all of boxing wants to see; in fact, Errol Spence Vs. Terence Crawford is arguably THE fight all of boxing wants to see, regardless of weight class. 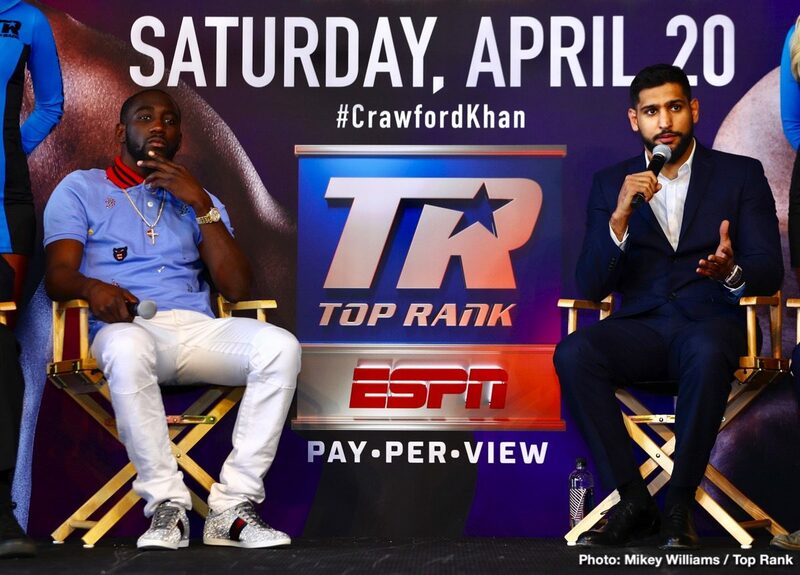 And Crawford promoter Bob Arum has let it be known that his fighter, the reigning WBO welterweight champion, wants the fight next, after he has dealt with British challenger Amir Khan on April 20th. “@ErrolSpenceJr said that he is ready to fight@terencecrawford. We are ready to do that next, once Bud is successful against @amirkingkhan on April 20. It’s what fight fans want. Al, should I call you or will you call me?” Arum wrote. Arum and Haymon are, as we know, not best of friends; Arum critical of how the reclusive Haymon conducts his business, behind closed doors and rarely appearing in public. It is to be hoped, though, that the two can somehow work it out and get this awesome match-up made. Fans do not really care too much about the politics and so forth behind a fight, they simply want to see the fight – the best against the best. And what fight fits the bill more than this one? Two superb talents, both unbeaten, both ranked highly ranked in the pound-for-pound charts and both holding a legit world title – who doesn’t want to see these two collide? Both fighters do seem to genuinely want the fight, now (barring a big upset sprang by Khan next month) all it seems we need is for Arum and Haymon to make the deal. This fight just has to happen. Spence, 25-0(21) and the reigning IBF champ at 147, has looked nothing short of perfect in his last few fights, but then so has Crawford, 34-0(25). Who is the better fighter here? Maybe it will be that we need three fights between Crawford and Spence to get a satisfactory answer. Greatness meets Greatness would perhaps be a good tag-line for this fight.